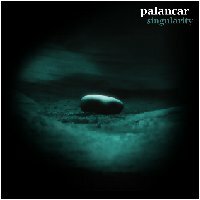 The latest release by Darrell Burgan under his Palancar music project is a dark longform ambient piece entitled Singularity. Clocking in at just a hair over one hour of non stop ambience, Singularity is a journey into and back out of the core of a painfully disturbed psyche. Is this release for the faint of heart? Well, perhaps. To be sure, it is quite dark at times, but there are also moments when the light breaks through in glorious splendor, to pierce the gloom and set things right again. And throughout the piece there are elements of hope, despite the foreboding, although we will concede that sometimes finding them takes a little effort. As is typical for Palancar, this is a piece that is best appreciated after repeated listens, as the details inherent in the piece simply cannot be absorbed in a single instance. Performed live on StillStream.com on February 8, 2008, this is a thought provoking ambient epic, one that we think you will enjoy despite its heavy subject matter. Heard this for the first time on Sadayatana. Sonically visual!!! beautiful dark Ambient music it is intellectual and vere deep, best to listen with the lights off laying down in bed at night and let your mind wonder.